When I first started doing magick it was really hit or miss, most often mess. My spell work was just not as effective as I wanted it to be. What was I doing wrong? If you have wondered the same thing, you have probably done similar mistakes. For example, I’d do a money spell, but I’d just get new problems! The real problem was, like many people, I just wanted a big payday. What I didn’t know was that this is really the wrong way to approach a lack of money. Many, if not most, spells written today are focused on the external opportunities or even requesting gifts from the Gods. Focusing on just the external can create new problems. What if I could tell you a Secret of how to do magick – in a way where your avoid ethics issues about money? I have mentored a number of people about this Secret. Now I will share with you this Secret. This line invites us to look within as we approach our magickal work. Let’s get more specific. You have been laid off and need a new job pronto! Bills are pilling up fast. Let’s use a sigil for this purpose. (You can learn more about sigils in my sigils post.) Remember the Gods are here to help. You can call on them for inner strength. All blocks I have put up, known and unknown, dissolve so I am a good candidate and my future employer hires me. Help me express the inner strength, skills and energy so I can acquire a job of my liking. I find new ways to serve others successfully so money comes to me naturally. All blocks I have put up, known and unknown, dissolve so I can create abundance in my life. Can you see how each sentence or phrase focuses on inner change, not the external “give me, give me”? With these phrases you are not looking for a handout. You are creating the abundance by changing you. This can be applied to the rest of your magick as well. Another example is love spells. Focus your magick on being more loving, or more open to love. Never do love spells upon a particular person. Instead do a spell to attract love to you in whatever form is appropriate by creating yourself as more loving. By focusing on inner change and developing our inner strengths, we can achieve our desires. When my friend Janet introduced me to her House Goddess, “Phyllis,” I was immediately intrigued. How would it feel to have a spiritual being watching over your home and protecting you and your loved ones? Many cultures focus on House Gods who protect the home in some form. There’s Cofgodas in Anglo-Saxon Paganism and Gasin in Korea. Lares, from ancient Rome, protects the home. Some House Gods just take care of certain rooms. Others oversee certain activities done in a particular room. My House God’s name is Timmy. That’s unusual in that House Gods tend to be female. Timmy protects my home and my loved ones who reside there. Like a divine watch dog, he keeps mischief at bay. He keeps us safe from negative entities who may wander by. Many readers may want to invite a House God into their home. Good news! They’re most likely already there. So how do you entice your House God to take his or her job more seriously? Make them offerings, of course. Here is how I began my relationship with Timmy. I got a statue that I liked. (House Gods tend to take residence in an object.) I found mine at the Northern California Renaissance Pleasure Fair but you can find your object anywhere. My statue is also a candle holder, which is a plus for offering candles. 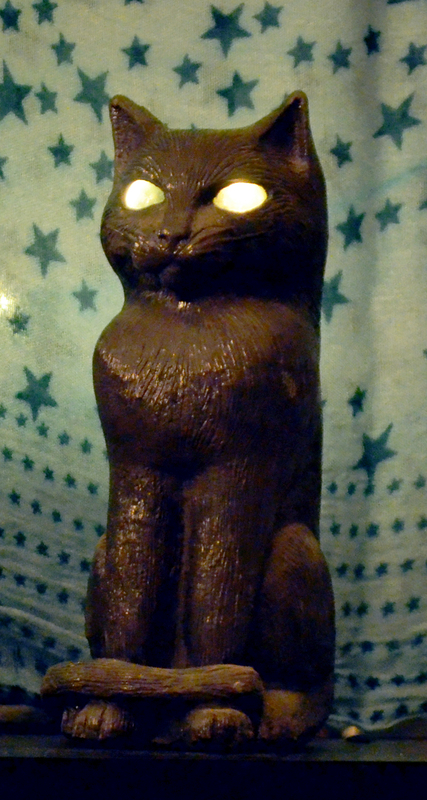 And it has the added coolness that the cat eyes glow when you place the candle in the statue. I placed the statue in a prominent place in my home and then asked that the House God come forward. I invited Timmy to protect my home and all my loved ones who reside in it. And in turn I would honor him by offering him this statue, and I would give him candles with my thanks. I lit the candle and asked him if this was acceptable. I said, “If you agree, please blink to confirm your answer is ‘yes.’” He “blinked” by flickering the fire. That’s how our conversation began. When you start a relationship with your House God, he or she will diligently continue with the protection job. Just make sure to give him or her offerings to say thank you. Do you already have a House God? Tell me about your experiences in the comments section below. Have you ever felt bothered by how media pushes that people need to be “young and beautiful”? 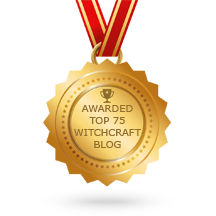 You may have noticed that Wicca pushes back against media in that Wicca honors and respects our elders. Have you also noticed how the Western World seems to overlook the merits of tempered wisdom and instead favors youth? Wicca acknowledges that for our species, youth is life. Youth is fertility and health. Wicca also acknowledges that, as one lives, wisdom can blossom. Wisdom arose as early people learned which berries were safe to eat and what plants could heal. With wisdom we not only survived, we thrived. Wicca acknowledges the value of both youth and elders’ wisdom. 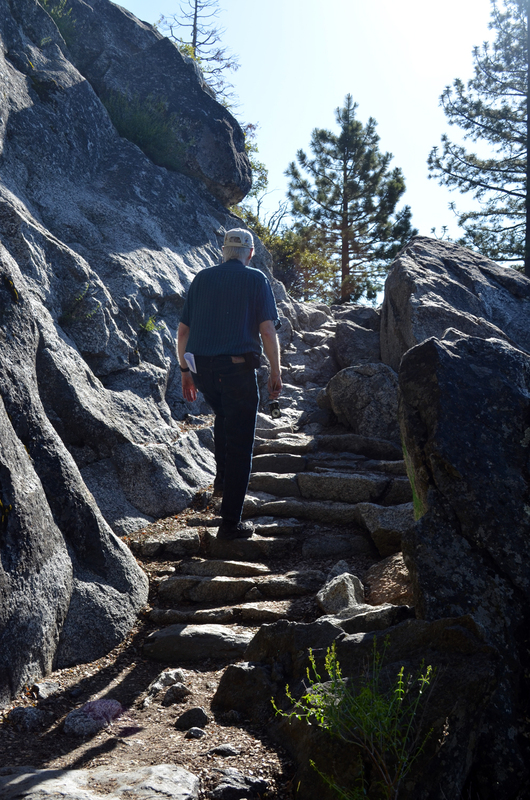 Elders have traveled the path of life ahead of us. They can help us do better on our personal path if we care to listen. Just like youthful strong bodies can get hard work done, elders have the wisdom of knowing how to work smart. This is important for survival. In past eras, without the wisdom of the elders, people couldn’t survive. Because of this we valued our elders. However, as time passed, we notice that technology appears to make elders’ advice and experience less relevant. With life moving as fast as it does, many of us would rather read something on the Internet, than talk to an elder. I get that. I love tech; I’m a blogger after all. But with all the bells and whistles technology has, we still need our humanity for us to really learn. It’s like reading about the Titanic disaster in a book as opposed to actually talking with a survivor who lived through the experience. The survivor will be able to tell you the visceral experience they had along with other crucial information that a book just can’t convey. We pick up so much in nonverbal cues: The look on a person’s face, the tonality of their voice, and the pace in which they speak. Think of it: Storytelling has been such a valuable part of humanity’s life. We learn so much because we actually experience the truth of a situation while we experience a person telling a story. In the Western World we have forgotten the important distinction of experience versus merely reading some facts conveyed in a barren form on the Internet. 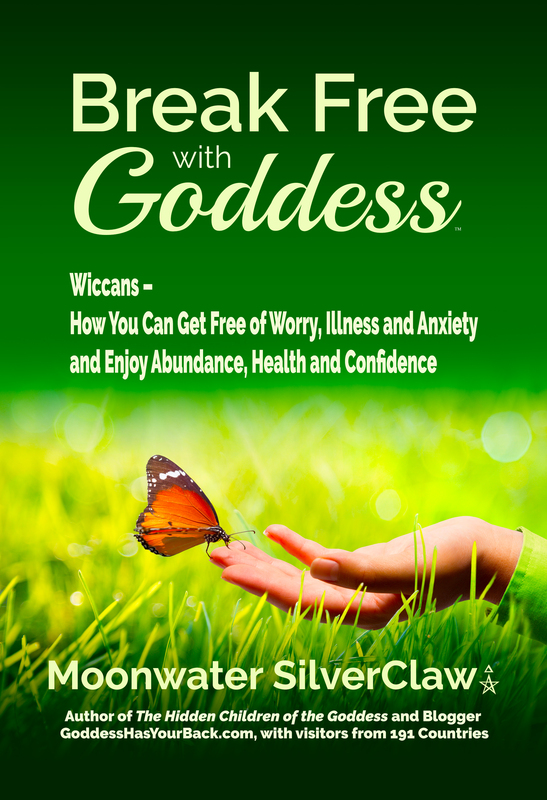 The good news is: Wiccans — like a number of Eastern cultures — have retained wisdom. 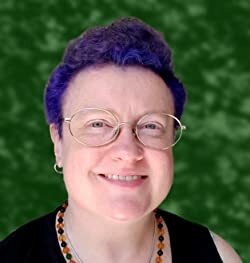 As Wiccans, we understand that we need both the vitality and virility of youth, but it must be tempered with wisdom and knowledge for survival and even enhancing one’s path in life. Wiccans know that to travel a spiritual path you need wisdom to know where to tread and where not to tread. Elders can talk with you about life, if not current technology. They can talk with you about the people who make technology. They can provide the patience and understanding about tough issues like loss and grief. They can even help you appreciate the joys of life. I invite you to consider elders as another resource. They can guide you in ways that something you read just can’t. 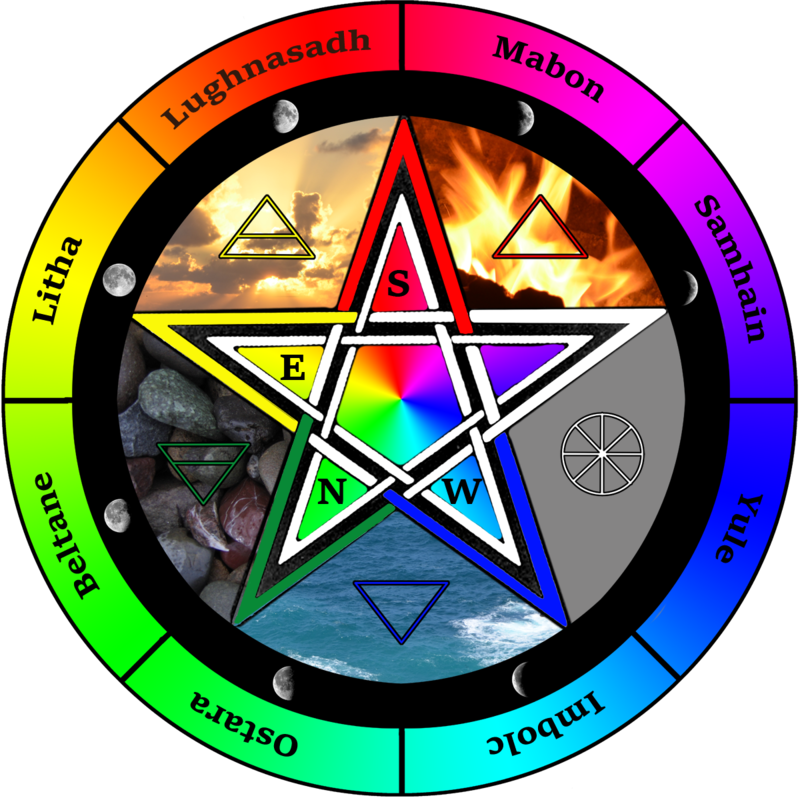 Wiccans know that there is more to life than tech. Some wisdom and learning only comes from having lived through tough experiences. See how you might connect with appropriate elders. You’ll find new facets of life opening to you. Perhaps you’ve noticed our new logo for this blog. It is the heron. Why this particular bird? The heron has been a representation of the Goddess for a long time. Below is the heron’s story as told by my friend Kay Pannell. After the fall of Troy, Prince Aeneas traveled to the area around Rome. One of the lands he visited was the land of the Rutuli, whose capitol was Ardea and whose ruler was Turnus. Turnus had been betrothed to Livinia, daughter of a neighboring king. Unfortunately, the king decided to give her to Aeneas instead. (You’d think after Aeneas’s brother Paris took Helen of Troy away from her husband, King Menelaus of Sparta, he’d have wised up about taking a woman away from a man with an army—but no). A war ensued between Aeneas’s fleet and Turnus’s army. During the hostilities, the city of Ardea was burned. Herodotus reported that from the ashes of the city a white bird arose that no one had seen before. It was the heron, and for ever afterward, the heron was called Ardea. When Carl Linnaeus began his classification in the 17th Century, he called the heron, Ardea Herodotus, for the story. The word, Ardea, also translates as “earth goddess” in Greek. This story is here to stay. I hope you enjoyed it. Now here’s my post for this week. This hits the mark I think. We may not thing we have much to give back but all of us has something, our talent—the gifts the Gods have given us. When we use our unique gifts to help others, the Gods smile upon us. For this is why we were given the gifts. To make each other’s lives more enjoyable. Using your talents doesn’t mean you have to make it a business. You don’t need to produce products or live on a demanding schedule to serve others. If you don’t cook, do you play music? Go to a children’s hospital and play for the kids. You don’t need to book gigs and have tons of followers. You’ll still make an important difference in the hospital. Can’t think of some particular gift to share? Donate some of your time and do volunteer work for some charity. For example, I donated time at The Peninsula Humane Society. I helped with the small animals. Now, I write this blog. This came as a surprise because of my dyslexia. But I was led to writing by the Gods themselves. It’s hard to argue with that. But you don’t need the Gods’ intervention to tell you what to share with others. Try something. You won’t know what is a helpful activity until you experiment a little. Consider looking up local organizations that need volunteers. Just donating a few hours a week can make a big difference. Express compassion and love as you invoke your talents. This pleases the Gods. By pleasing the Gods we honor them. You can make a difference for the Gods. How do you please the Gods with your talents? Let me know in the comments section. Thank you. Don’t forget about the workshop, sign up now. Buy the workbook Beyond the Law of Attraction to Real Magick now and give me the receipt number and get $10 off your ticket to the workshop! You can sign up for the workshop below. See you soon.